Beyond India’s popular Golden Triangle lies a calm desert terrain and a fairy-tale setting. Nellie Huang uncovers a mosaic of colors in the offbeat region of Rajasthan. 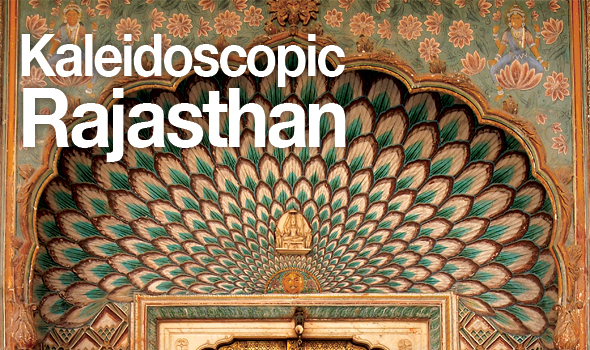 With mystique and elegance, Rajasthan has the air of a dreamy Indian princess. It captivates with the old-world appeal of its ancient cities and the energy and fervor of its chaotic streets. There are few places quite as evocative as Rajasthan, the extensive region of Northwestern India bounded by the mystical Great Indian Desert on one end and the Aravalli mountain range on the other. Legacies from the region’s prosperous past can be seen from its extravagant palaces, forts and temples – most of which are the country’s richest collections of architectural marvels. Backdropped by shimmering lake waters, giant sand dunes and the iridescent blue sky, the region’s natural beauty is unparalleled. Our journey begins in Jaipur, the chaotic capital of Rajasthan and the most visited city in the state. Rattling out of Delhi on a dusty sleeper train, my partner and I arrive in Jaipur at the wee hours of the morning in time to witness the city in a state of slumber. A moment like this is rare in Jaipur where chaos and mayhem are just part of their lifestyle. As the third apex of India’s ‘Golden Triangle’ alongside Delhi and Agra, Jaipur has long been established on tourist itineraries. 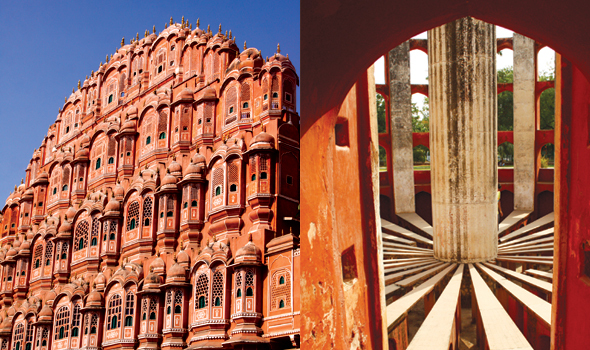 For first arrivals, Jaipur makes an excellent introduction to the region. As the first planned city in India and the capital of the royalty, it is home to the country’s most extravagant royal monuments. Although there are not many signs of prosperity on the streets of Jaipur these days, the ancient edifices remind us of its glorious past. We weave our way into the old walled quarter of Pink City – a name given for good reason: its regal palaces, buildings and forts are splashed in pastel rose color, embellished with elaborate carvings. In the heart of it stands the emblematic City Palace, built by Jaipur’s first ruler, Maharaja Sawai Jai Singh II, and served as a royal residence, even to this day. The labyrinth of courtyards, royal gardens and peacock-carved gates give a glimpse into the past. Rising from the center of the palace grounds is the Diwan-I-Khas, a marble floored chamber that houses the world’s largest sterling silver vessels. Other sites worth visiting include the largest and best-preserved observatory, Jantar Mantar – a World Heritage Site packed full of insightful astronomical discoveries; and the nearby Hawa Mahal, the Palace of Wind. Its unique five-storey exterior is also akin to the honeycomb of the beehive with its 953 windows decorated with intricate latticework. History aside, Jaipur is best known for having the best handicraft and textiles in India on offer. Whether you’re on the hunt for tie-dye, silk, rugs or jewelry, the jumble of bazaars scattered throughout the old walled city will not disappoint. Tripolia Bazaar is the best market to buy shimmering lac bangles, but its myriad of carpets, bags and handicraft might prove equally tempting. For the first-time visitor, Rajasthan’s human masses and hectic traffic can be overwhelming, especially so in the tourist-trodden trails around Jaipur. But once you escape beyond – into the remote areas of Rajasthan, it’s easy to appreciate its allure. We head west towards the India-Pakistan border in search for a real taste of Rajasthan. Etched on the rim of the burnished Thar Desert is the far-flung town of Jaisalmer. From the distance, it looks like the middle of nowhere; but as I soon discover, Jaisalmer is vigorously alive. Ten paces inside the old city walls and I’m already falling for its understated charisma. 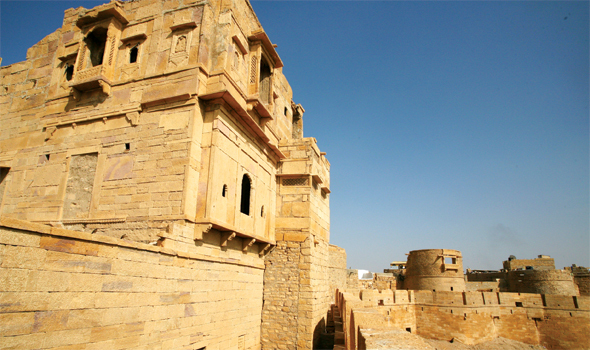 Most cities in Rajasthan are defined by colors; Jaisalmer is no exception – earning its title as the Golden City. It’s easy to see why: in the heart of town, a towering honey-colored fort rises from the baked desert sand, like a shimmering mirage. This is the world’s oldest inhabited fort, made up of a mishmash of havelis (Rajasthan-style mansions), temples and an impressive ancient castle. The Jaisalmer castle, with its 99 beautiful bastions, is built almost entirely from yellow sandstone and seems to shine from within when bathing in the afternoon sun. A local tells me the best way to see the old town of Jaisalmer is on foot. We meander through lanes lined with antique shops and jewelry stores, constantly fending off gentle persuasions from merchants, “Madam, come and take a look at my store!” We barter for beaded necklaces and silver bracelets before sipping chai on a rooftop cafe. In Jaisalmer, our pace slows down to a languid rhythm as we soak in the city’s undercurrent. On the outskirts of town, the golden brown Thar Desert beckons. We embark on an overnight camel safari to experience living with a nomadic tribe. Hopping onto a jeep, we first travel to the Bada Bagh, a series of honeycombed royal cenotaphs, and visit the Amar Sagar temple complex before meeting our guide Mohammed. He resembles an Arabic Bedouin – a scarf wrapped around his head, a full-body tunic draped over his shoulders and a weathered, tanned look to accompany it. We ride our camels past a distant oasis, over rippling sand dunes to a thatched hut in the middle of the dessert. “Welcome to my house!” Mohammed says. The evening is spent hanging out with Mohammed’s children and observing his wife cook. After a delicious meal of rice, dal, potato chutney and rotis cooked on an open fire, we roll out our sleeping mats and watch the sky dance before us. Considered inaccessible by most travelers only a few decades ago, tourism had come knocking on Jaisalmer’s doors only in recent years. While most visitors make it to the capital city of Jaipur, only the hardy traveler ventures as far as Jaisalmer—which is why it has retained its charm. Our journey culminates at the impossibly romantic lakeside town of Udaipur – affectionately known as the Paris of the East. Blending in with its rustic, dreamy charms, Udaipur’s haphazard undercurrents and occasional buzz give it added character. Udaipur is a confection of white havelis and pale yellow palaces studded with turrets, cupolas and latticed balconies overlooking Lake Picchola and backdropped by the Aravalli Mountains. From afar, the whimsical buildings seemingly float on the lake, casting its shadows on the water surface. In the midst of the lake rises the Taj Lake Palace, one of the top heritage hotels in Udaipur. Many hotels in Udaipur have been converted from old palaces and mansions, refurbished to give a perfect blend of old-world charm and modern-day luxury. The hotel spreads across a four-acre island – an almost surreal vision in white marble. It can only be reached by boat and entry is for hotel guests only. 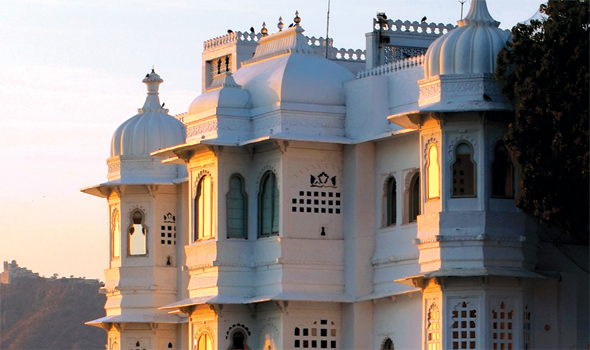 Like other cities in Rajasthan, Udaipur’s old town is centered on its flamboyant City Palace. In contrast to other palaces in the region, this one has the grandest gates, biggest courtyards and plushest furnishings. Mural paintings and carvings are washed in bright blue and red, while arch-shaped windows wedged with stained glass project rainbow colors. Tucked within the maze-like old town is the Jagdish Temple dedicated to Lord Vishnu. As the largest temple in the city, the three-storied temple is made up of beautifully carved pillars, decorated ceilings and painted walls. The spire of the main temple is around 79 feet high, dominating the skyline of Udaipur. At the foothills of the temple, we witness devout pilgrims sending their offerings in the form of bright pink jasmine flowers to Lord Vishnu. It serves as a reminder that Rajasthan is a world in its own – religiously faithful, naturally raw and most of all, culturally rich. Amidst the towns and cities is a place full of character, pride and beauty, as anyone who roams the streets of Rajasthan will know. One day, Rajasthan’s secluded towns might be transformed into busy tourist hubs, and the tinge of authenticity will be gone. My own dream is that Rajasthan – India’s Kaleidoscopic Nation – stays still in time, and that the future waits just a bit longer to arrive.